Italian Cultural Institute in collaboration with the Italian Embassy in Prague, promotes cultural relations and exchanges between Italy and the Czech Republic and spread Italian culture and Italian language in the Czech Republic. 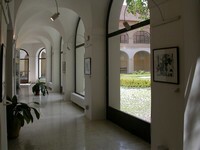 In the area of bilateral relations, the Institute operates in accordance with the general guidelines that were established under the Cultural Agreement signed in 1971, which followed with a more detailed content of cultural programs (currently in force an agreement on Cultural four-year period 1998-2001). Between Italy and the Czech Republic was signed in 1990 the Agreement on scientific and technical cooperation, as specified in implementing programs to four-year validity. The Institute promotes cooperation and establishes contacts with institutions, companies, universities and scientific academies and cultural world Czech Republic and also participated in the design and organize projects that are focused on getting to know Italian culture and reality, one of which is classified as exchange visits of professors and researchers, dealing with student grants awarded in the Czech government and an Italian citizen at the university records. 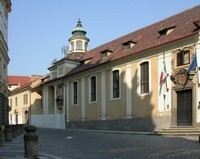 Through the still greater involvement of institutions of the host country's cultural and programmatic lines institute in Prague thanks to its development activities that emphasize the particular cultural expression of Italy page simultaneously, while in an effort to focus on the mutual influence continues to deepen relationships that historically exist between Italy and the Czech Republic from XIV. century to the present. Mutual exchange of shares between the Italian and Czech institutions is one of the basic forms through which the activities of the Institute takes concrete shape. 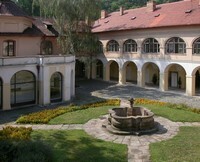 On the one hand, the Institute collaborates with the Italian state and private institutions and organizations that exported cultural events in the Czech Republic, on the other hand, is involved in the organization of Czech cultural events and exhibitions taking place in Italy, which acts as a link between the two countries. The visual angle Institute operates not only as a starting point for Prague and the Czech Republic, but also as a center of production of Italian and European culture, which organized the symposium, and as a center of Italian language, which contributes to the development of custom publishing. In addition to organizing cultural events at a high level institute offers a range of activities associated with the development and dissemination of Italian language and culture, which include courses of Italian language and obtain a certificate cils. The Institute also works as a library, department of magazines and video library. The spread of Italian language institute in addition to participating in the organization and price competition in the field of poetry and translations of Italian texts and award-winning works will then become part of its publishing activities, including publishing catalogs of exhibitions. The institute's building will be repaired in the near future. We are counting on help from the largest foreign and Czech companies.